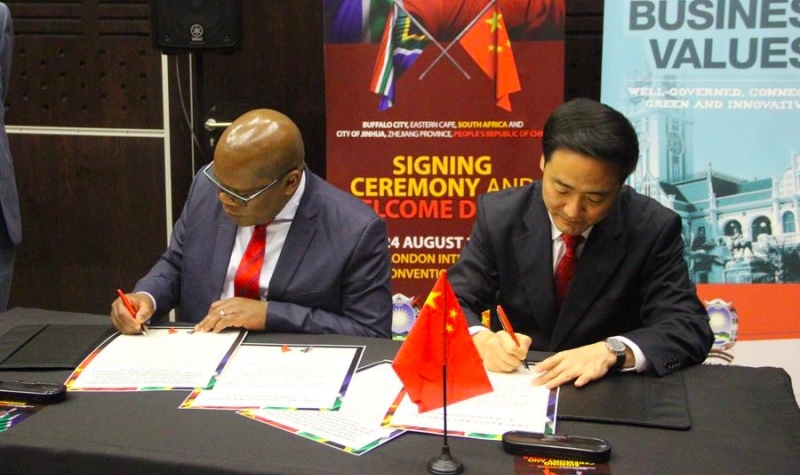 Hundreds of jobs are set to be created in the City’s manufacturing sector through an agreement signed by the Buffalo City Metro and China’s Jinhua municipality. Four new electronics factories are expected to be established by the end of the year from the deal and at least 400 permanent jobs created when the factories open. No new buildings would be built as the factories, manufacture electronic devices including computers and cellphones would be housed at the East London Industrial Development Zone (ELIDZ). The signing ceremony was held on Thursday 24 August at the East London International Convention Centre in Quigney. The day started with a visit to the Mpongo Park Game Reserve and finished off with a signing ceremony. The visit comes after Executive Mayor Xola Pakati and his delegation visited China last month to negotiate lucrative deals with the country in an effort to bring jobs to the city. The visit intended to invest in the automotive, information technology, clothing and textile sectors. “Let the signing of this agreement be the beginning of a good chapter for both our cities,” he said.